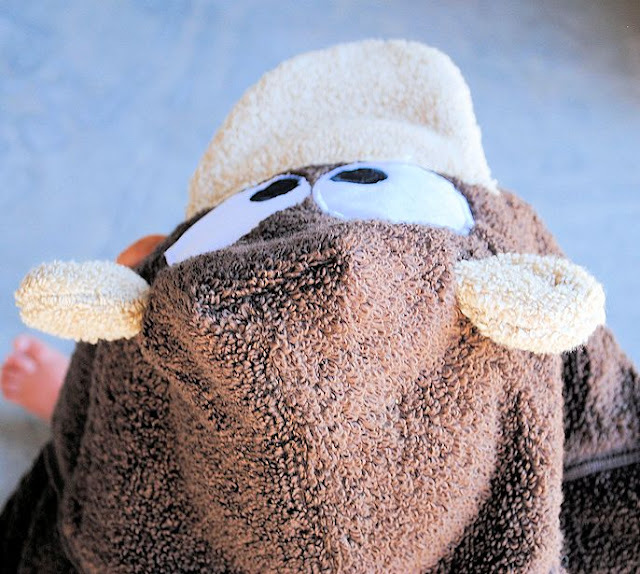 This is the first time I have done a monkey towel and I have to say, I LOVE how it turned out. 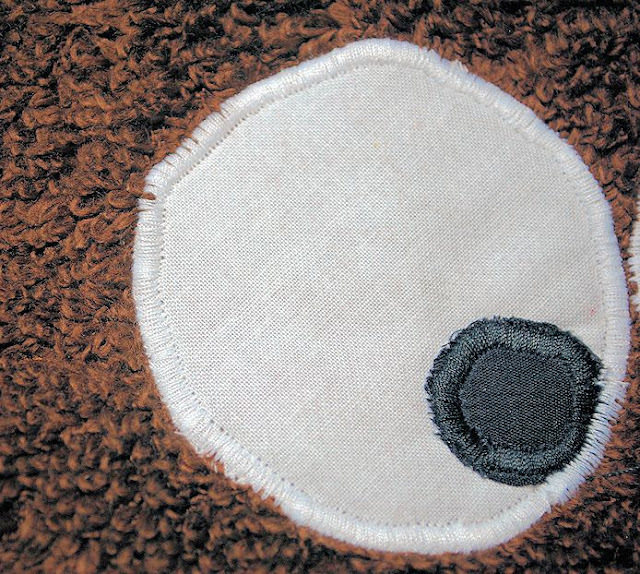 At first I was worried that it might end up looking like a bear, but all the little kids at my house while I was making it could tell what it was. So I’m calling that a success! 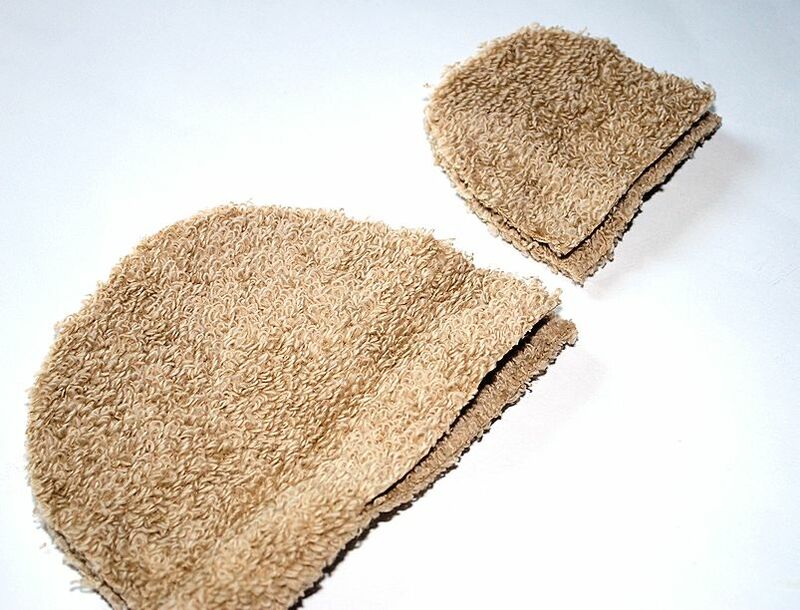 These towels are not hard to make. They cost around $10, maybe a little less, and take under an hour. Well under an hour is you are experienced at sewing. Now, flip it over and work on the back of your half hand towel. Cut out eyes. I like to use fabric that has already been attached to iron on transfer. You need 2 white pieces and 2 black pieces. My black ones are about the size of nickels. Really you can just eyeball this. Make them as big or small as you want them. Iron your eyes in place (or you can skip this step and just sew them in place). 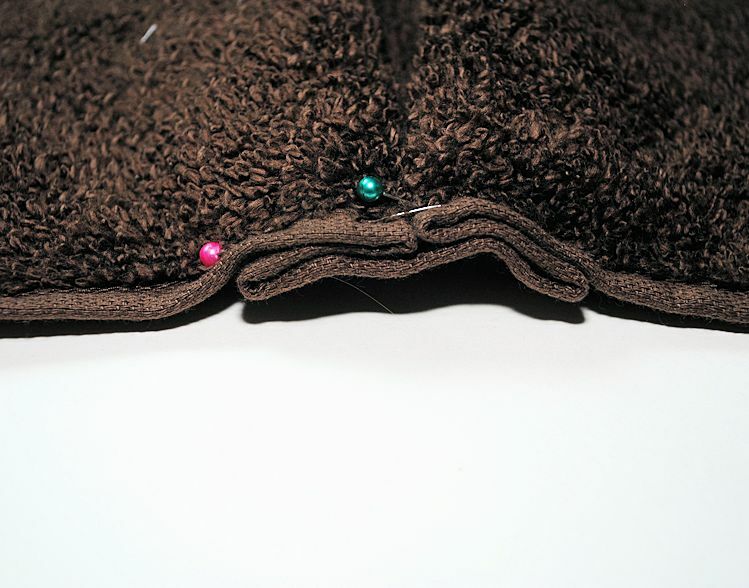 Sew around them leaving the straight edge open to turn them. Turn them right side out. Now, for the ears, figure out where you want them and then cut a small slit through the towel. Make it smaller than the width of the ears. Slide the ears down into place. Because the slit is smaller than them they will scrunch up a little. This is good. Guess what? Your face is done! 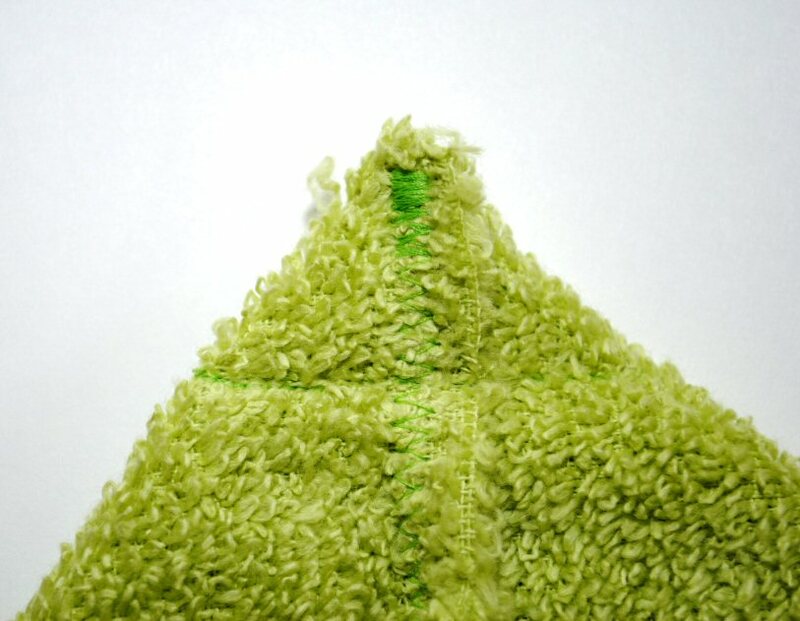 Then sew a straight line to form a triangle at the tip. 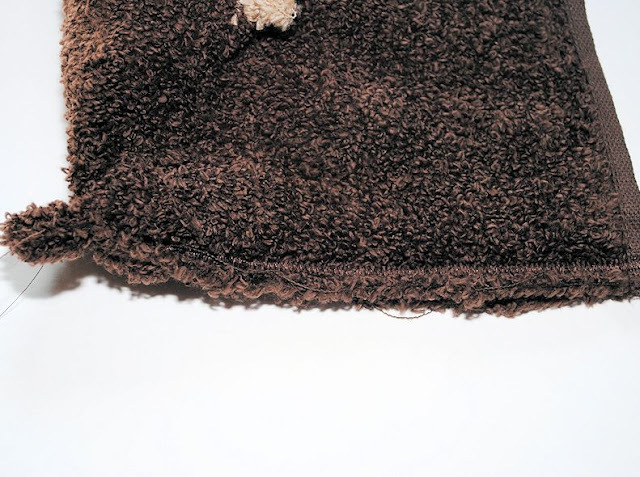 Then snip off the very tip of the towel. This just gives your monkey less of a pointy head. As for my model, I think he likes it! Is it just me or is he adorable? Now, be sure to check out the Ladybug and the Frog as well! Next month I am thinking Dragon hooded towel. What do you think? 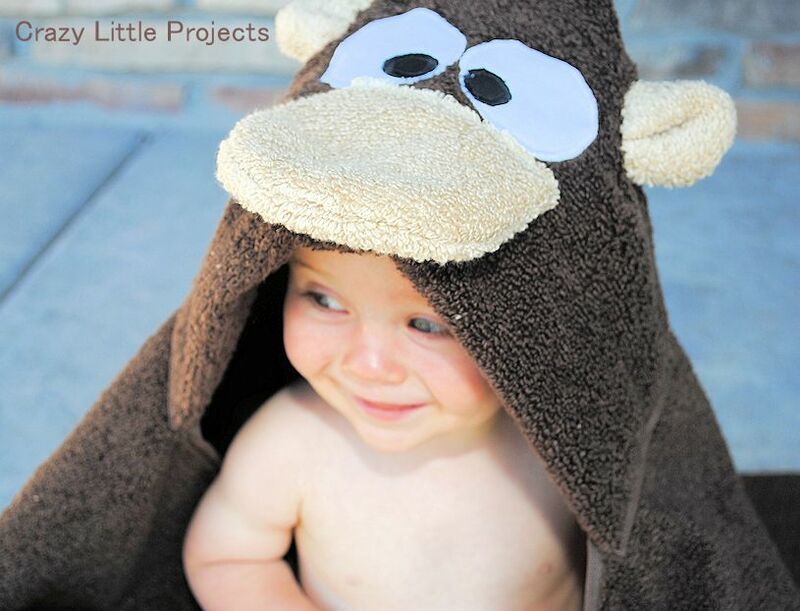 Follow me on facebook, by RSS Feed or on Pinterest to get the lowdown on each month’s towel and other projects! I just love these towels! They are so stinkin’ cute! Great job! Thanks for sharing at the Pomp Party! Pinning to our Pomp Party board! Holy cow, so cute! Thanks for the tutorial. Oh my gosh! You are so talented. I so adore this. Thanks for sharing. LOVE the monkey!!! 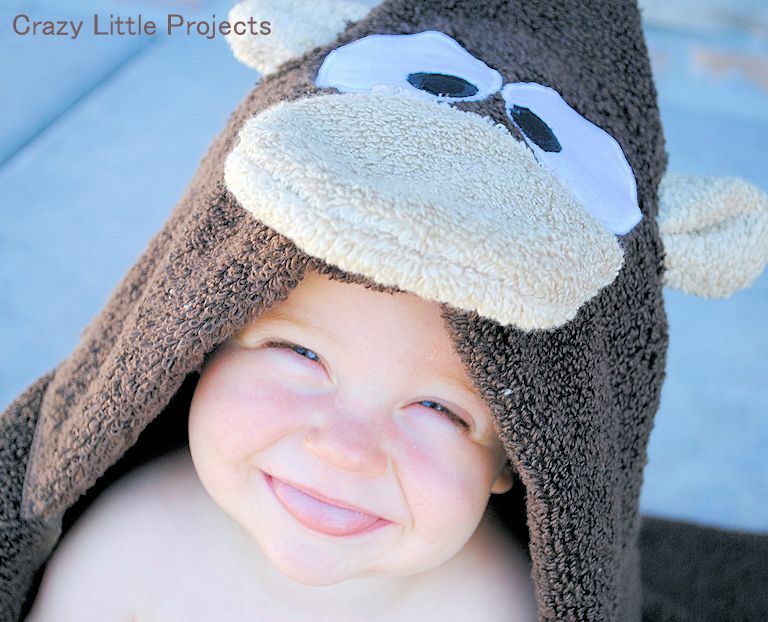 I always adore your hooded towels! You’re really talented! Very cute! 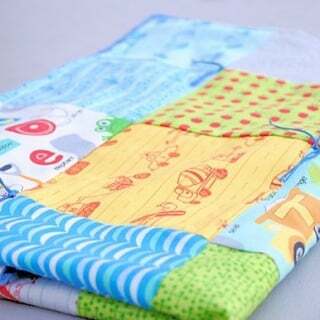 This would make a perfect baby gift. Thanks for sharing it. Cutest little monkey in that towel! ;) Thanks for sharing this awesome idea!! So adorable! 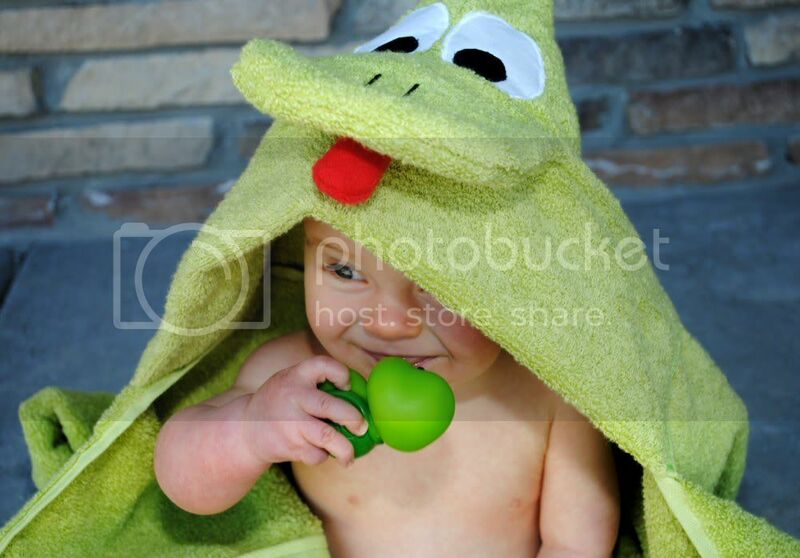 The frog one was also a cute one! This is adorable. Perfect for swimming weather. 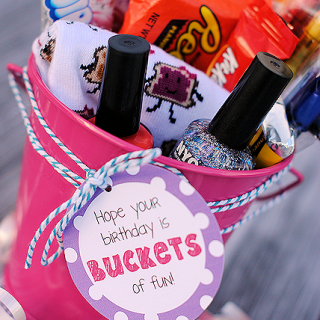 I should make them for my Littles! I am a fan of the frog! CUTE! Can’t wait to see more posts. o-m-g this is so cute! 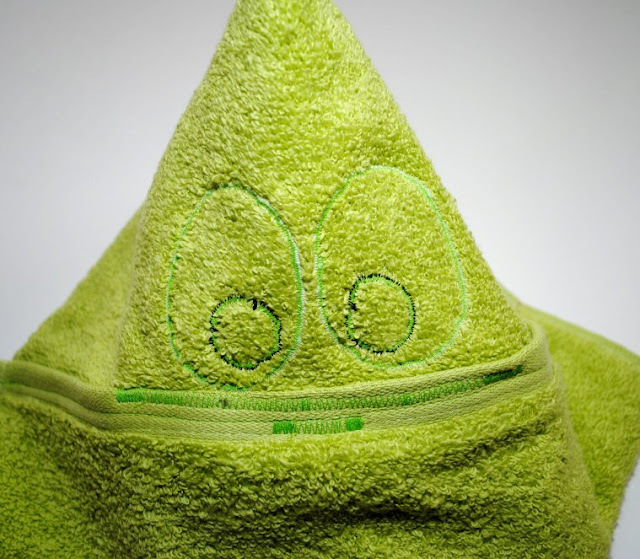 i love this towel! I can’t wait to make one! My 2yr old took one look and said ‘monkey on baby’ … These are all so cute. I have two boys now and a little one due soon, I am looking forward to the duck tutorial so I can make three different towels before Christmas. LOVE this! Wonderful Tutorial! Such a cute little monkey you have there! I love it! Hi, love the hooded towels. tried making the monkey towel. had trouble with the cut ends of the towel raveling. did you have this problem and if so how did you remedy it. On what part? 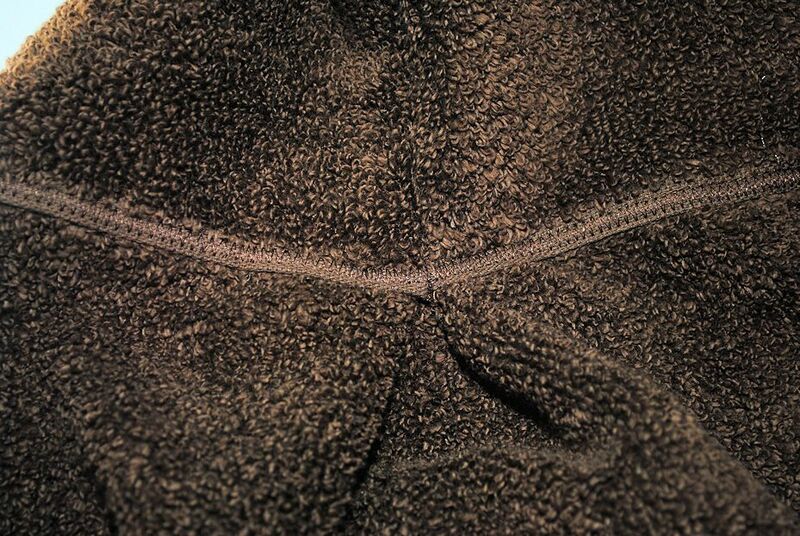 If you just mean like the inner seam of the hood I don’t worry about it. As long as you stitched it nice and tight it should hold just fine. If not, just resew over it. You could zig zag those edges if it is bothering you. What>?!!? You didn’t learn hamburger way and hotdog way in Kindergarten? Ha ha! :) Hamburger way is the fat way so that when you cut it it is a nice fat piece of fabric. Hotdog would be the vertical way and you would end up with long and skinny. Does that make any sense? Do you have an easy way to print these? Thanks! Hmmm, I guess I didn’t do pattern pieces on this one. (I do them on some.) You really just need 2 big white eyes, 2 black eyeballs, a snout and 2 ears. ps. As a beginner, this took me abt 3 hrs from planning to cutting & sewing till the end result. these are great. Do you think you could come up with a way to do one that has a large tiara on the front instead of a face? i have a niece who would looooove that. I’m just not sure of the best way to go about creating that. Cheers. I’ve had that idea in my brain but haven’t been sure how to do it yet either. I’ll think about it! As always fantastic and clear instructions. I’ve made frog and dragon a few times for gifts ( always get much excitement from the recipient) and made the monkey last night. He is gorgeous!! Thank u so much you are so talented. I love seeing your new creations all the time. These are the cutest towel patterns. I think your instructions are clear, but I was wondering if you could add some rough measurements to your instructions. 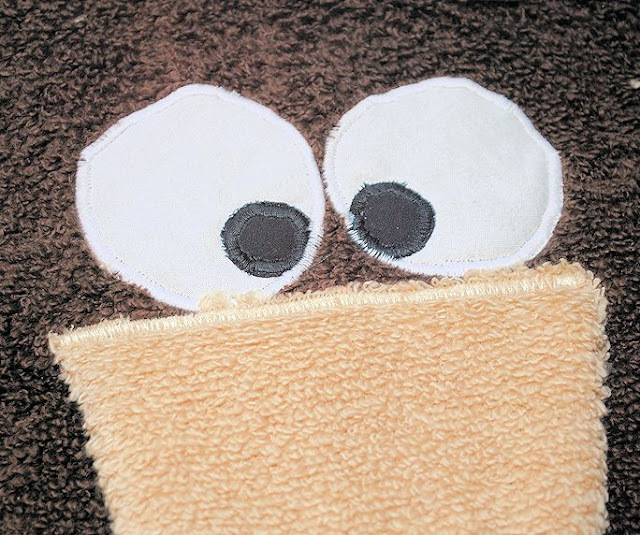 I’m making the monkey towel and realized I didn’t know how big (without trial and error) to make the eyes, mouth and ears. I’m not looking for a pattern to cut out, but a rough idea of how big you made the items in the picture would be helpful. (ie the eyes I used were 2 in circles, the mouth was 4inx6in, the ears were 3inx4in) Also placement of pieces would be great. I didn’t know if the mouth on the monkey sticks out over the brown towel or if it is even with it. 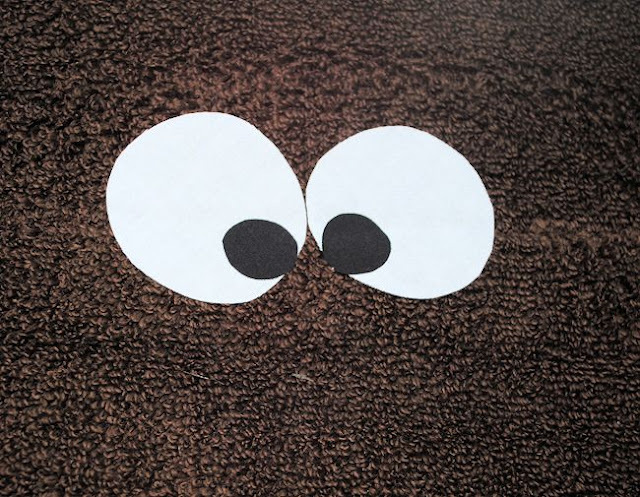 I could see from the picture the eyes are placed about centered on the fold line. I think this little extra information would be helpful on all your patterns for those of us that are not great at “free-styling” stuff. Thanks so much. Love, love, LOVE these towels. My daughter just asked me to make some for her two year old. My sweet granddaughter loves owls, monkeys, and ligons (her word for lions). Guess I will be sewing up a zoo! Very cute towels, but I notice that some of them you don’t share the pattern pieces. Where can I find the pattern pieces? 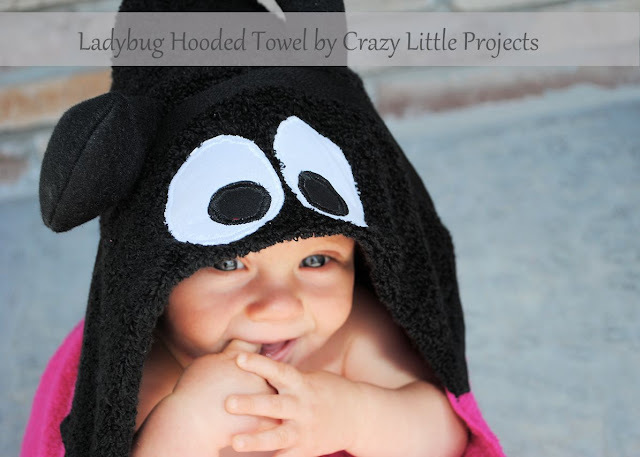 Love the hooded towels, have made the ladybug and the lamb. 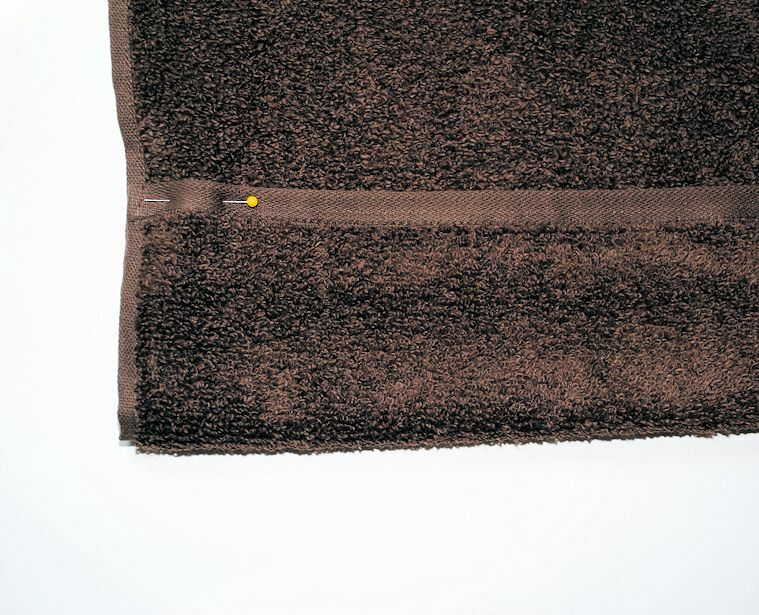 Wondering if there is some trick in putting the multi-layers of towel through your sewing machine? 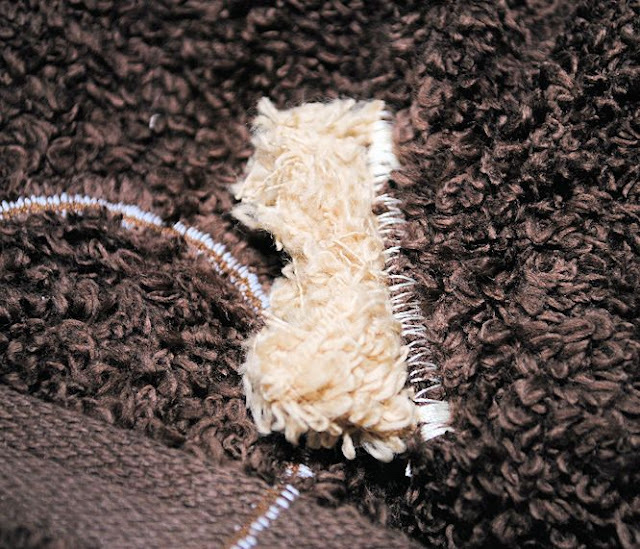 My machine absolutely refused to take the 6+ layers of towel when sewing in the ears of the lamb. Ended up taking it to a quilting store that sold heavy duty sewing machines and even then, it struggled? Thank you. I have a pretty heavy duty machine. The only tip I have is to use the heavy duty needles.